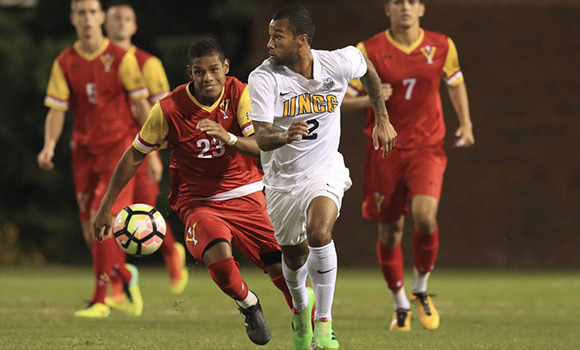 UNCG's Matteo Busio chases down the ball during last year's home match-up against Southern Conference foe Virginia Military Institute on Oct. 29. UNCG beat VMI 8-1. UNCG Athletics kicks off the 2017-18 home season in a big way this weekend with three marquee events as volleyball, women’s soccer and men’s soccer all host key contests in a 72-hour span on campus. The weekend will feature a variety of activities surrounding each match-up, and all games are free and open to the public. Can’t make it to campus? Catch the action on ESPN3. UNCG Volleyball is looking to break the single-game attendance record of 1,131 set back in 2010 and is encouraging all fans to come out and support the team. The first 250 UNCG students will receive a free Bojangles’ tailgate in Fleming Gym. The Spartans are celebrating National #JustBecause Day with mystery giveaways for the first 100 UNCG students. Monday will mark the annual “Close the Caf Night” on campus as Fountain View Dining Hall will be closed and dinner will be served at UNCG Soccer Stadium. The tailgate will open at 5 p.m., and all students with a meal plan can swipe their cards to enjoy the all-you-can-eat buffet. All fans can partake in the pre-game buffet for a cost of $9 for adults and $5 for children. For more information, visit uncgspartans.com.